Gods (Skt. deva; Tib. ལྷ་, Wyl. lha) — one of the six classes of beings. 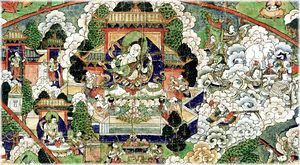 These divine samsaric states are the fruit of positive karma generally related to acts of generosity, meditative concentration or practices of asceticism, but which are still tainted by worldly goals. Because the life of the gods is free from suffering, the idea of practising Dharma never occurs to them. When the effect of the actions which sent them there is exhausted, these gods will suffer a lot, while their body is gradually degenerating. At the end of their lives, they have very frightening visions of their upcoming lower rebirth in samsara, in which these gods inevitably fall back into. The main feature of the realm of the gods, is that it is devoid of suffering, a realm of changeless beauty and sensual ecstasy. Imagine the gods: tall, blond surfers, lounging on beaches and in gardens flooded by brilliant sunshine, listening to any kind of music they choose, intoxicated by every kind of stimulant, high on meditation, yoga, bodywork, and ways of improving themselves, but never taxing their brains, never confronting any complex or painful situation, never conscious of their true nature, and so anesthetized that they are never aware of what their condition really is. Gods of the formless realm. This page was last edited on 30 December 2017, at 17:37.